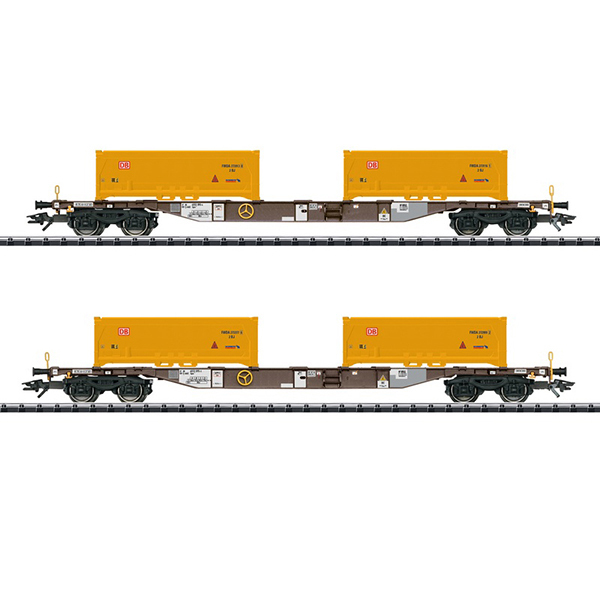 Prototype: Two (2) type Sgns four-axle KLV transport cars for AAE. Each car loaded with two (2) tubs of excavated soil from the project Stuttgart 21. The cars look as they did in 2014. Model: The cars have type Y 25 Lsd welded trucks and rectangular buffers. The flat car floors are prototypically partially open and are constructed of metal with striking "fish belly" side sills. Each car is loaded with two (2) tubs of excavated soil from the project Stuttgart 21. The cars have different car numbers and tubs with different tub numbers, each individually packaged. There is also a master package. Total length over the buffers 46 cm / 18-1/8". AC wheelset E700150. The locomotive to go with this car set can be found in the Trix H0 assortment under item number 22690. Other cars with different car numbers and tubs with different tub numbers can be found at Trix under item number 24138 and at Märklin under item numbers 47130 and 47131. The locomotive in an AC version to go with this car set can be found in the Märklin H0 assortment under item number 36182.